"Many of the molecules found by ROSINA DFMS in the coma of comet 67P are compatible with the idea that comets delivered key molecules for prebiotic chemistry throughout the solar system and in particular to the early Earth increasing drastically the concentration of life-related chemicals by impact on a closed water body. The fact that glycine was most probably formed on dust grains in the presolar stage also makes these molecules somehow universal, which means that what happened in the solar system could probably happen elsewhere in the Universe." Michele Buscema, Dirk J. Groenendijk, Sofya I. Blanter, Gary A. Steele, Herre S.J. van der Zant, Andres Castellanos-Gomez. Kavli Institute of Nanoscience, Delft University of Technology, The Netherlands. The isolation of graphene has opened the door for the studying of the large family of layered two-dimensional (2D) materials, driven by the extraordinary properties that these materials show in their single and few-layer form [1-4]. Graphene, a one-atom thick layer of carbon atoms, has shown excellent electrical properties (e.g. mobility in the order of 170 000 cm2/Vs at room temperature) and large breaking strength [5,6]. However, its applicability in low-power field effect transistors (FETs) and optoelectronic devices (e.g. photodetectors) is hampered by its zero bandgap. This absence of a bandgap has intensified the current research in other 2D materials with an intrinsic bandgap . For instance, silicene, a single layer of silicon atoms, represents a semiconducting analogue to graphene but so far it has only been realized in an ultra-high-vacuum environment, a severe limitation for further studies and applications . Other promising candidates for optoelectronic applications are the members of the transition metal dichalcogenides (TMDCs) material class [9-13]. The large and direct bandgap of their single-layer form provides strong light absorption – a necessary condition for large photoresponse – but operation is limited to part of the visible spectrum. A material with a direct and small bandgap is needed to extend the detection range accessible with 2D materials. Few-layer black phosphorus is a new member of the 2D-materials family. Black phosphorus is a layered allotrope of the element phosphorus and, in bulk, it is a semiconductor with a direct bandgap of 0.35 eV . In its few-layer form, the bandgap is predicted to strongly depend on the number of layers, from 0.35 eV (bulk) to 2.0 eV (single-layer). Moreover, FETs based on few-layer black-phosphorus show promising electrical properties [15-18], making them an appealing candidate for tunable photodetection from the visible to the infrared part of the spectrum. In our recently published work , we characterized the response to light excitation of FETs based on few-layer black phosphorus (thickness ranging from 3nm to 8nm). Figure 1a shows a schematic of the device and of the measurement circuit. Without illumination, the black-phosphorus FETs show ambipolar behavior, as both holes and electrons can be induced in the conducting channel by the gate electric field. The measured mobilities are in the order of 100 cm2/Vs and current on/off ratio in the order of 103, demonstrating good electrical behavior. Under illumination, we measure a sizable photoresponse to excitation wavelengths from the visible up to 940 nm (see Figure 1b). Figure 1c shows the photocurrent measured for a single pulse of light excitation from which we estimate a rise time of 1 ms, demonstrating broadband and fast photodetection. For comparison, photodetectors based on single-layer molybdenum disulphide (MoS2) can reach higher responsivities (~ 880 X 103 mA/W) but their response time is limited to 0.6 sec . Figure 1: (a) Device schematics (b) Source-drain current vs. gate voltage in dark (black solid line), with λ = 940 nm illumination (purple solid line), λ = 640 nm illumination (red solid line) and λ = 532 nm illumination (green solid line). The total incident optical power is 750 μW for all wavelengths. (c) Source-drain current vs. time for a single period of light modulation with a mechanical chopper (different device from panel b). Taking advantage of the ambipolarity, one could think of electrostatically defining a PN junction in a few-layer black phosphorus flake, as already pioneered in single-layer tungsten diselenide (WSe2) [9-11]. A PN junction could be used to boost the photoresponse and generate electrical power via the photovoltaic effect. Given the small and direct bandgap of few-layer black-phosphorus, it would be possible to harvest photons also in the near-infrared part of the spectrum. 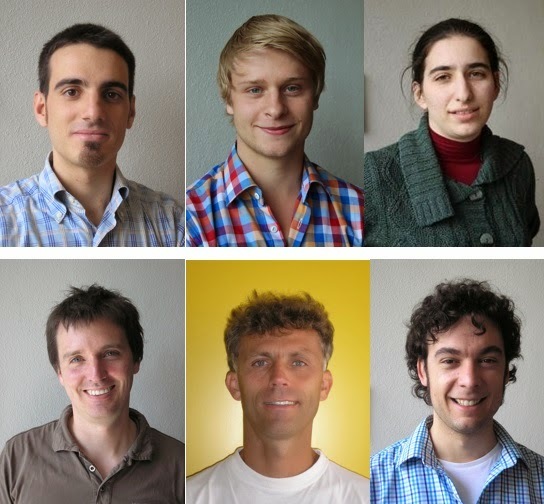 K. S. Novoselov, A. K. Geim, S. V. Morozov, D. Jiang, M. I. Katsnelson, I. V. Grigorieva, S. V. Dubonos, A. A. Firsov, "Two-dimensional gas of massless Dirac fermions in graphene". Nature, 438, 197-200 (2005). Abstract. K.S. Novoselov, D. Jiang, F. Schedin, T.J. Booth, V.V. Khotkevich, S.V. Morozov, A.K. Geim, "Two-dimensional atomic crystals". Proceedings of the National Academy of Sciences of the United States of America, 102, 10451(2005). Full Article. K.S. Novoselov, A.K. Geim, S.V. Morozov, D. Jiang, Y. Zhang, S.V. Dubonos, I.V. Grigorieva, A. A. Firsov, "Electric Field Effect in Atomically Thin Carbon Films". Science, 306, 666 (2004). Abstract. Qing Hua Wang, Kourosh Kalantar-Zadeh, Andras Kis, Jonathan N. Coleman, Michael S. Strano, "Electronics and optoelectronics of two-dimensional transition metal dichalcogenides". Nature nanotechnology, 7, 699–712 (2012). Abstract. L. Wang, I. Meric, P.Y. Huang, Q. Gao, Y. Gao, H. Tran, T. Taniguchi, K. Watanabe, L. M. Campos, D.A. Muller, J. Guo, P. Kim, J. Hone, K. L. Shepard, C. R. Dean, "One-Dimensional Electrical Contact to a Two-Dimensional Material". Science, 342, 614-617 (2013). Abstract. Changgu Lee, Xiaoding Wei, Jeffrey W. Kysar, James Hone, "Measurement of the Elastic Properties and Intrinsic Strength of Monolayer Graphene". Science, 321, 385-388 (2008). Abstract. B. Radisavljevic, A. Radenovic, J. Brivio, V. Giacometti, A. Kis, "Single-layer MoS2 transistors". Nature Nanotechnology, 6, 147-150 (2011). Abstract. Patrick Vogt, Paola De Padova, Claudio Quaresima, Jose Avila, Emmanouil Frantzeskakis, Maria Carmen Asensio, Andrea Resta, Bénédicte Ealet, Guy Le Lay, "Silicene: Compelling Experimental Evidence for Graphenelike Two-Dimensional Silicon". Physical Review Letters, 108, 155501 (2012). Abstract. Britton W. H. Baugher, Hugh O. H. Churchill, Yafang Yang, Pablo Jarillo-Herrero, "Optoelectronic devices based on electrically tunable p–n diodes in a monolayer dichalcogenide". Nature Nanotechnology, 9, 262-267 (2014). Abstract. Andreas Pospischil, Marco M. Furchi, Thomas Mueller, "Solar-energy conversion and light emission in an atomic monolayer p–n diode". Nature Nanotechnology, 9, 257-261 (2014). Abstract. Jason S. Ross, Philip Klement, Aaron M. Jones, Nirmal J. Ghimire, Jiaqiang Yan, D. G. Mandrus, Takashi Taniguchi, Kenji Watanabe, Kenji Kitamura, Wang Yao, David H. Cobden, Xiaodong Xu, "Electrically tunable excitonic light-emitting diodes based on monolayer WSe2 p–n junctions". Nature Nanotechnology, 9, 268-272 (2014). Abstract. Zongyou Yin, Hai Li, Hong Li, Lin Jiang, Yumeng Shi, Yinghui Sun, Gang Lu, Qing Zhang, Xiaodong Chen, Hua Zhang, "Single-Layer MoS2 Phototransistors". ACS Nano, 6, 74-80 (2012). Abstract. Néstor Perea-López, Ana Laura Elías, Ayse Berkdemir, Andres Castro-Beltran, Humberto R. Gutiérrez, Simin Feng, Ruitao Lv, Takuya Hayashi, Florentino López-Urías, Sujoy Ghosh, Baleeswaraiah Muchharla, Saikat Talapatra, Humberto Terrones, Mauricio Terrones, "Photosensor Device Based on Few-Layered WS2 Films". Advanced Functional Materials, 23, 5511-5517 (2013). Abstract. Yuichi Akahama, Shoichi Endo, Shin-ichiro Narita, "Electrical Properties of Black Phosphorus Single Crystals". Journal of the Physical Society of Japan, 52, 2148-2155 (1983). Abstract. Han Liu, Adam T. Neal, Zhen Zhu, David Tomanek, Peide D. Ye, "Phosphorene: A New 2D Material with High Carrier Mobility". arXiv:1401.4133 [cond-mat.mes-hall] (2014). Likai Li, Yijun Yu, Guo Jun Ye, Qingqin Ge, Xuedong Ou, Hua Wu, Donglai Feng, Xian Hui Chen, Yuanbo Zhang, "Black phosphorus field-effect transistors". Nature Nanotechnology, 9, 372–377 (2014). Abstract. Steven P. Koenig, Rostislav A. Doganov, Hennrik Schmidt, A. H. Castro Neto, Barbaros Özyilmaz, "Electric field effect in ultrathin black phosphorus". Applied Physics Letters, 104, 103106 (2014). Abstract. Han Liu, Adam T. Neal, Zhen Zhu, Zhe Luo, Xianfan Xu, David Tománek, Peide D. Ye, "Phosphorene: An Unexplored 2D Semiconductor with a High Hole Mobility". ACS Nano, 8, 4033-4041 (2014). Abstract. Michele Buscema, Dirk J. Groenendijk, Sofya I. Blanter, Gary A. Steele, Herre S. J. van der Zant, Andres Castellanos-Gomez, "Fast and Broadband Photoresponse of Few-Layer Black Phosphorus Field-Effect Transistors". Nano letters, 14, 3347-3352 (2014). Abstract. Oriol Lopez-Sanchez, Dominik Lembke, Metin Kayci, Aleksandra Radenovic, Andras Kis, "Ultrasensitive photodetectors based on monolayer MoS2" Nature Nanotechnology, 8, 497-501 (2013). Abstract. Copyright © 2005-2018. Library of Congress catalog no. ISSN 2372-1782. Published from 141G California St, Arcadia, CA 91006, USA. Write to us: 2Physics.com. 2Physics.com publishes invited semipopular level articles on key developments in various fields of Physics. Authors may submit semipopular level articles based on their own research paper(s) published in refereed journal(s). Alternatively, they may consider sending a proposal (one short paragraph) and a list of related publications before writing the full article. We will let you know our decision within a few days after we receive the proposal.